Plants or trees that remain waterlogged for long periods of time eventually die. The main reason for this is that the roots are not getting the oxygen the plant requires, leading to "root-rot". So how then is it possible to grow plants in an hydroponics or aquaponics system, without soil and in water? All of the different aquaponic system designs, namely, flood and drain (ebb and flow), NFT (nutrient film technique) and DWC (deep water culture) ensure that the roots continuously get enough oxygen/aeration. In media based flood-and-drain systems such as the one above, oxygen is supplied to the plant roots during the drain cycle. As the water drains out of the grow bed air(oxygen) is sucked in between the grow media, filling the empty spaces vacated by the water. Most beginners fail to take the oxygen requirements of the plants into consideration when designing their first NFT system. The idea of nutrient film technique is to supply a small trickle of water to the tap root of the plant, thus alowing the rest of the lateral roots to be suspended in air within the pipe to get the required oxygen. Most beginners set the level of water in the pipe too high, leading to root rot. You need to ensure that you can adjust the level of the water in the pipe to suit the different stages in the life cycle of the plant. When you first transplant the seedlings to an NFT system, the water level has to be high enough so that some of the roots make contact. However, as soon as the tap root reaches the bottom of the pipe, you need to adjust the level of water to the lowest possible level in the pipe so that only a small stream flows through the pipe. 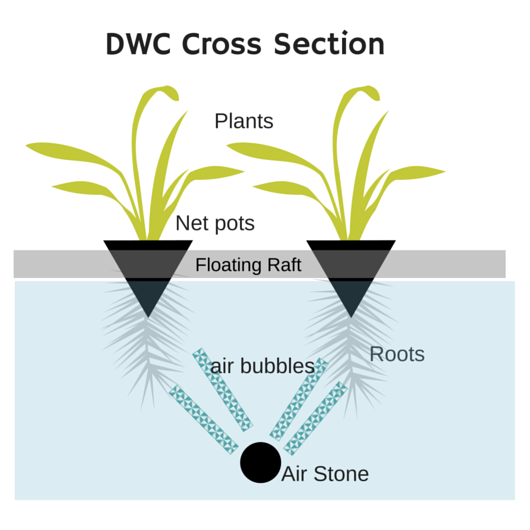 In a DWC system (also referred to as floating raft) plant roots are totally submerged in water. Thus, air needs to be pumped into the water using a compressor/aerator, then diffused by an airstone or an air-hose in order to supply adequate oxygen to the roots. Without the oxygen, plants in a DWC system would get root-rot and die. A good indicator of heallthy roots is when they have a clean white colour. Make sure that whatever system you design supplies the plants with enough water for hydration, and LOTS OF OXYGEN.